View your quadcopter's flight in REAL TIME! It's a micro-sized quad with first-person view! 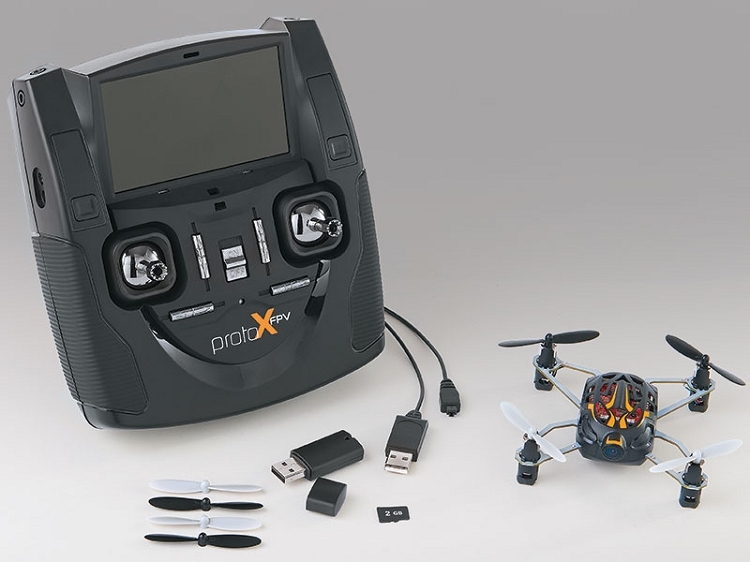 The Proto-X FPV comes equipped with a 1280 x 720P camera that shoots HD videos with a range of 240 feet (73 meters) that you can watch in real time on the transmitter's 4.5" screen. It's like you're inside the model — while piloting it from the ground! The included memory card and card reader let you download videos and images to your computer — and they'll all be amazingly clear, thanks to the 3-axis gyro and 3 accelerometers that create extremely stable flight. The Proto-X FPV's durable construction means you can fly indoors or out, and seven LED lights add to the flying fun. Enjoy worry-free operation with the 6-channel 2.4GHz radio, which comes with a hood for easier outdoor viewing. The Proto-X FPV comes completely assembled, with a LiPo battery and USB charge cord included. Just install four "AA" batteries and start flying! The triple-axis, three-accelerometer gyro produces extremely stable flight for great videos, indoors or out. Dual modes on the 6-channel 2.4GHz radio let you learn flying basics in Normal mode before moving up to more advanced Expert mode. Features 7 bright LED lights — blue in the front and red in the back to help you stay oriented. Not only does the 4.5" screen display lots of information, it also features 5.8GHz video transmission with a range of 240 feet (73 meters). A hood is included for easier viewing outside. An output jack on the transmitter lets pilots use optional goggles. The 1280 x 720P HD camera shoots 30 FPS with a 120° field of vision. You can then download the videos using the included micro memory card and reader. The micro memory card slot allows for secondary recording through the transmitter. The button of the right side of the controller activates secondary recording. The Proto-X FPV recharges quickly with the included USB charge cord. "Soft touch" hand grips make for more comfortable flying. With the Proto-X FPV you also get a 6-channel 2.4GHz radio, a 650mAh 1S LiPo battery, USB charge cord and 4 extra rotor blades. Just four "AA" batteries are all you need to start flying and taking exciting videos and photos!